I’ve been giving Google’s streaming-music, the somewhat awkwardly-named Google Music All Access service, a try ever since the announcement at IO. For the most part I like it, and I’ll likely move to it full-time (especially given the news of an iOS app soon), though I haven’t really figured out the dual nature of it, both having a streaming-music service and wanting me to upload my music library. I am trying to find the answer to one apparent shortcoming when compared to other services. 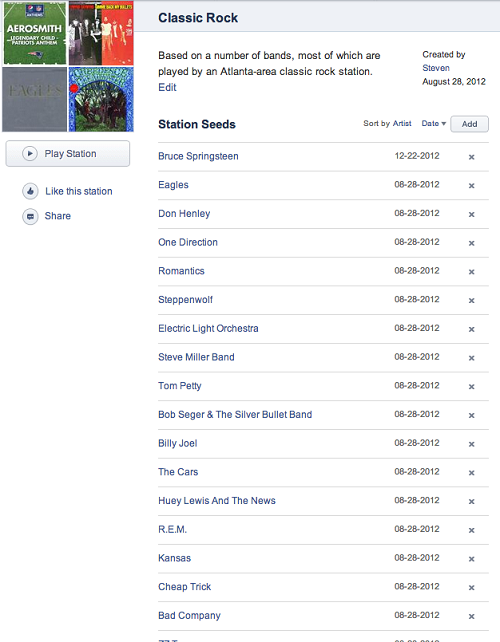 When I create a “radio station” on Pandora, I can seed it with as many songs or artists as I’d like. I haven’t found a way to do this with Google Music All Access – once a station is created based on one artist there doesn’t seem to be a way to add more variety or refinement to the station’s definition. If you’ve figured out a way to do so, please let me know.